People don’t usually admit to financial troubles easily. But when you find yourself saying ‘I need help with my finances’, then maybe you’re in a deeper rut than most people. Getting back to financial stability is a daunting task, but one that is very doable. Below, we’re listing down some helpful tips on how to manage money better. The sad thing these days is that a lot of people are racking up debt because they were not educated properly about money. Schools teach math and accounting, but few teach their students how to manage their money. In truth, most people who are in debt just didn’t take the time to learn about money management. We’re talking not only about the knowledge of what money can do, but also the skill on how to use it to your advantage. Analyze Your Expenses and Spending Habits—you need to do an assessment on where you currently are financially. List down all your sources of income and come up with the amount you get for each income source. Then list down all your expenses. Deduct income from expenses and you get your net earnings after expenses (commonly called as savings). Make an Inventory of Your Assets—know which assets you have and how much they’re worth. Aside from knowing how much is in your bank account, make an inventory of everything you own. Include assets like your car, jewelry or house. The purpose of knowing your assets’ worth is that you can sell these off for money in the future. Only Use your Credit Card when you can make the Monthly Payments—in other words, don’t use your credit card to overspend. If you can’t make your payments on time, card companies will charge you with penalty fees and interest rates. These fees and interest can accumulate overtime and can balloon your debt even more. Do your Taxes Well—you can actually save a lot of money if you take advantage of tax breaks that are offeredto private employees. If you can’t do it yourself, ask an accountant to help you with your tax declarations. They can give you advice on how you can pay less tax. Pay Yourself First—this means you set aside a specific amount of money for specific expenses before you blow off your hard-earned cash buying unnecessary things. This takes some discipline to do, but this move will pay off (your debts) in the long run. By paying yourself first, you train yourself not to overspend. Cut Back—After doing your spending habit analysis and asset inventory, the next important step is to find the expenses or costs you can cut back on. Run through your expense list and you’re sure to find items you can live without, so cut back on those. Don’t worry if the amount you save is not that big. Every penny counts and can translate to a bigger amount in the long run. Find New Income Streams—don’t bank on getting a raise at work; find another way to earn without jeopardizing your current job. You can perhaps start a small business on the side, or you can do a part-time job on weekends. When you can afford it, consider getting insurance or put surplus money in low-risk investments like mutual funds. These investments will pay you off handsomely in the future. Find a Solid Support Network—managing your finances is not easy and can cause a lot of stress. A lot of people have been known to break down because of financial problems. Get a solid support group—one that has your back when your chips are down. Consider family and friends to be part of this network. And it’s advisable to consult with a financial expert. They can give you tips on how to better manage your money. We hope you gained some insight by reading this article. Financial freedom is not impossible to achieve as long as you educate yourself on how to manage money properly. All it takes is an open mind for learning, a strong will to resist the temptation to spend, and a healthy dose of self-discipline to always pay yourself first. 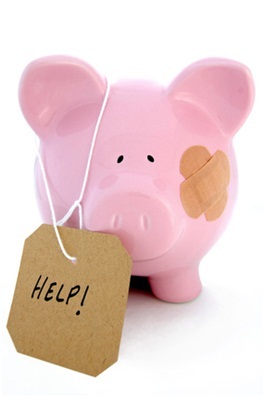 Admitting that “I need help with my finances” is a good start for each person to work towards a better financial situation.